Virginia Tech athletic director Whit Babcock said Buzz Williams left the Hokies basketball program “a lot better than he found it” and expressed empathy for the team, which learned of Williams’ decision to take the same job at Texas A&M in a meeting early Wednesday morning. 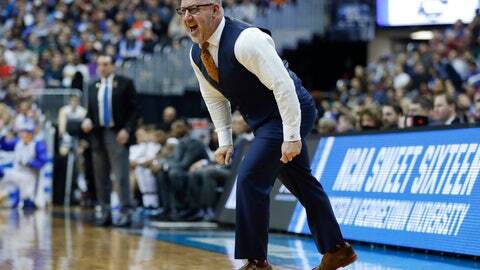 Williams, the Hokies’ coach for the past five seasons, is a native of Greenville, Texas. He earned his Master’s degree at the school and was an assistant coach for the Aggies in 1998-99. Williams first mentioned the possibility of interest in the Aggies job after the ACC tournament, Babcock said, and the two had discussions about things the school would like to do for the program, but “I think that the pull of Texas, his home state, was pretty strong in the end,” Babcock said. He set no timetable for naming a replacement in a teleconference with reporters and said he does not maintain the proverbial “short list” so many athletic directors are said to have in the event they have to find a new coach. He also said no search firm would be involved in the process. Williams inherited a team that had finished last in the Atlantic Coast Conference and guided them to a 100-69 record in his five seasons. The Hokies were 26-9 this past season and went to the NCAA Tournament for the third consecutive season, both program records. They lost 75-73 to No. 1 overall seed Duke in the Sweet 16.